Mandarins were grown in China and Japan on a large scale since the 16th century. Mandarin was the last of the important citrus fruits to arrive in Europe as late as the early 19th century. In 1805, two varieties of the Mandarin oranges were brought into England from Canton. From England, they were introduced into the Mediterranean region. By 1850, the fruit was well-established in Italy. 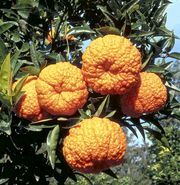 Some time between 1840 and 1850, a mandarin from China was imported by the Italian Consul and planted at the Consulate in New Orleans. It was carried from there to Florida and later reached California. The 'Owari' Satsuma arrived from Japan in 1878 , and nearly a million budded trees were planted in the Gulf States from 1908 to 1911. Another variety, the King Mandarin, was sent from Saigon to California in 1882. In 1892 or 1893, two fruits of 'Ponkan' were sent from China to Florida, and seedlings from there were distributed and led to commercial propagation. 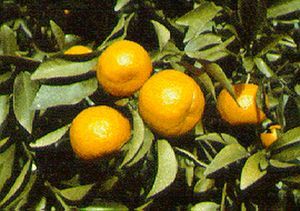 Commercial production of mandarins started in the early 1900's. 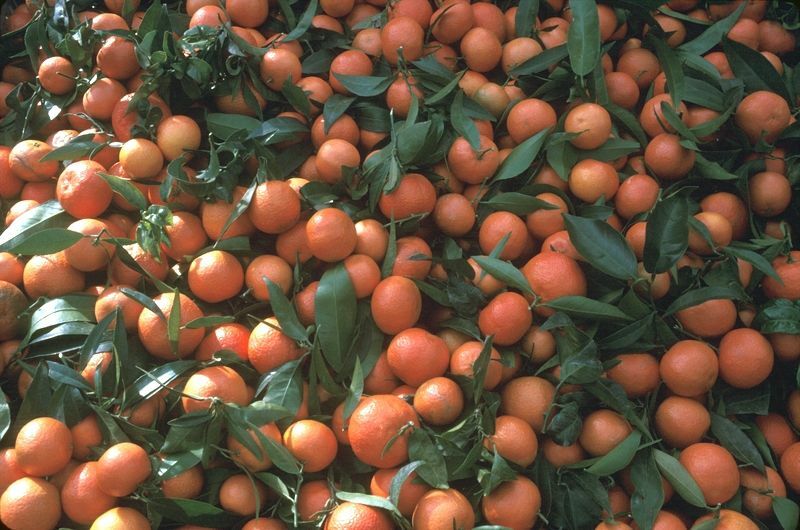 The biggest mandarin producers today are China, Spain, Japan, Brazil and Turkey. 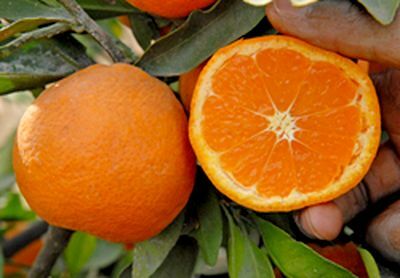 The biggest mandarin exporters are Spain, China, Morocco, Turkey and South Africa. See: Introduction, Citrus world production 2007/08. The fresh citrus market worldwide has changed dramatically in the past 20 years. Consumers and supermarkets now prefer easy-peeling, seedless, tasty mandarins with nice rind color. 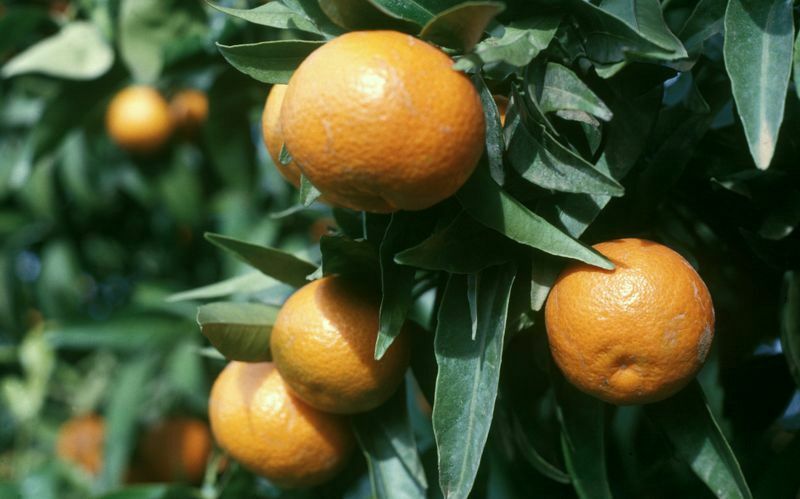 As a result, mandarins are now the fastest growing sector of the fresh citrus industry in California and world wide. Citrus. 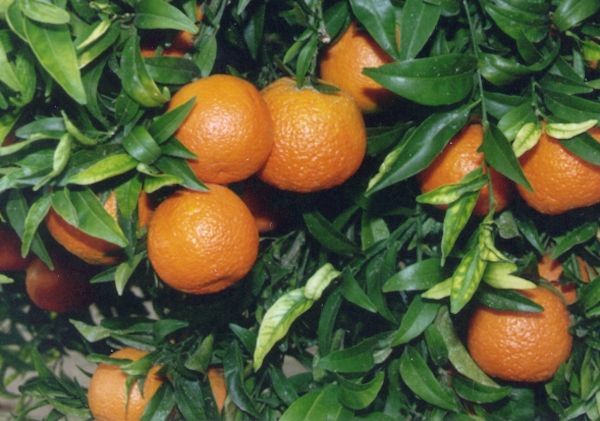 The number of commercially important mandarin varieties almost equals the number of all other horticultural Citrus types combined. The Citrus Research Station of the French National Institute of Agricultural Research on the Mediterranean island of Corsica boasts over 350 named mandarin cultivars and hybrids in the catalogue of its holdings, four trees of each variety. Counting the cultivars of presumably same origin under alternative names leaves approximately 240 different mandarin varieties. Many of the pictures on this mandarin page come from the collection of the Corsica experiment station. Taking into account that more than 100 named satsuma cultivars exist in Japan alone, over 450 mandarin types are known today and the estimated number of commercially grown mandarin varieties in the world is more than 300. The classification of mandarins is more complicated than that of other citrus types. The grouping of all mandarins into 3 species by the American author Swingle earlier seemed too arbitrary and the division into 36 mandarin species and their subtypes by the Japanese author Tanaka seemed too elaborate. The system followed by Robert Willard Hodgson in his book 'Horticultural varieties of Citrus' (chapter 4. of 'The Citrus Industry'), which divides mandarins into four species, was in use for a long time. 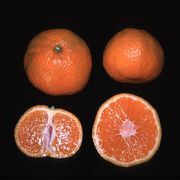 Deliciosa (Mediterranean mandarin), nobilis (King type) and unshiu (satsumas) formed species of their own because of their origin, distribution and characteristics. 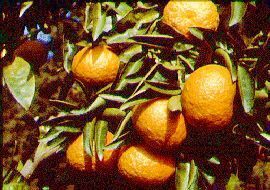 All other mandarin types (common mandarin, clementines, tangerines, tangors, tangelos and their hybrids) were grouped under reticulata. 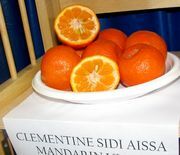 In this presentation all mandarins are classified Citrus reticulata Blanco according to the current botanical practice. For each type the earlier classifications are given as synonyms. The small-fruited mandarin relatives are listed separately at the end. 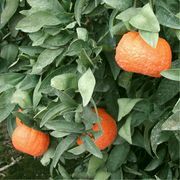 The mandarin varieties are divided into seven groups of mandarins on this page and six groups in the Mandarin hybrids page. The Mandarin types table (see below), serves as an index to the 13 types and over 70 varieties briefly described with an adjoining picture and over 30 closely related cultivars of theirs are mentioned. 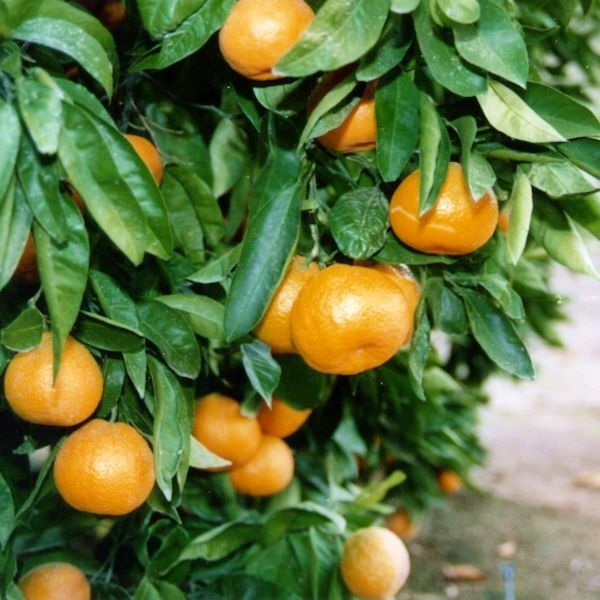 On this and the adjoining Mandarin hybrids page there are over 100 different kinds of mandarin. 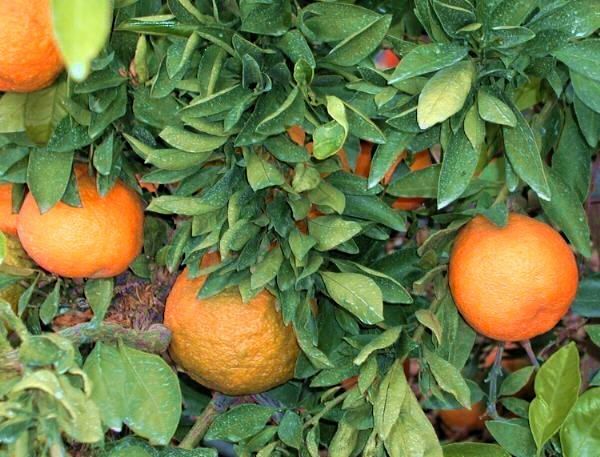 Unlike other citrus types, some of which require quite specific conditions, mandarins thrive in widely varying surroundings. Mandarin types are grown from temperate Mediterranean-like areas through hot and humid tropical countries to almost desert type dry and arid environments . 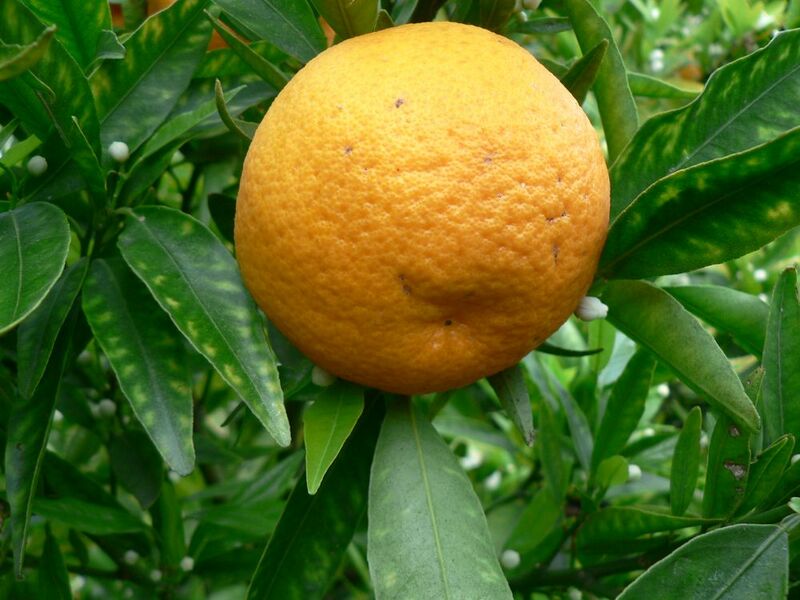 Another exception is that some mandarin varieties tolerate cold and frost better than other citrus types. Certain varieties grown in China can tolerate frost for several weeks. Satsumas have reportedly survived frost down to -11 degrees C (12 F) lasting several days. On the other hand mandarins do not keep well on the tree after maturation. 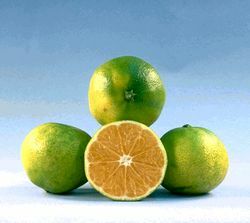 Due to their thin and often loose rind mandarins also tolerate storage and transportation less successfully than other citrus types. Mandarins are best when eaten within 2 - 3 weeks after picking. Mandarins are mostly eaten fresh. 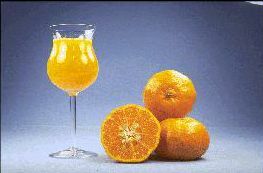 A small amount of mandarin juice is produced. Mandarins are not well suited for industrial processing but segments canned in syrup can be found. They are used in fruit salads and other desserts or as fillings or decoration in cakes. Mandarin oil has an important position in food industry as a flavouring. It is used in sweets, gelatins, ice-cream, chewing gum, pastry and confectioneries. 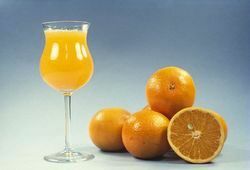 It is also used in soft drinks, mixers, essences and flavourings as well as in mandarin liqueurs and other alcohol products. Citrus nobilis Andrews, non Lour. Because of their distinct origin, distribution and characteristics, which differ from other mandarin types the deliciosa, nobilis and unshiu types were earlier described as independent species. 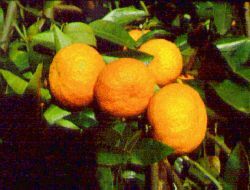 The author of this presentation has collected all common mandarin types and their hybrids under Citrus reticulata. As might be expected, this group is quite varied and exhibits a wide range in both tree and fruit characters. These types are characterized by small flowers and leaves and small to medium-large fruits. Clementines, satsumas and some ordinary mandarins belong to the so-called "easy peelers". Their skin is soft and loose. Some of the varieties of Citrus reticulata characterized below are "tightskin" mandarins. Although peelable, their rinds are much more tightly adherent than the loose skin mandarins and puff very little, if at all. Ponkan. This is the famous and highly reputed Ponkan of South China and Formosa, the Batangas mandarin of the Philippines, and the Nagpur suntara or santra (various other spellings) of India. Ponkan is probably the most widely-grown mandarin in the world, being heavily-grown in China, India, and Brazil. Elsewhere this fruit has importance in Ceylon, Indonesia, Malaysia, the Philippines, South China, Taiwan, and the southern part of Kyushu Island, Japan. 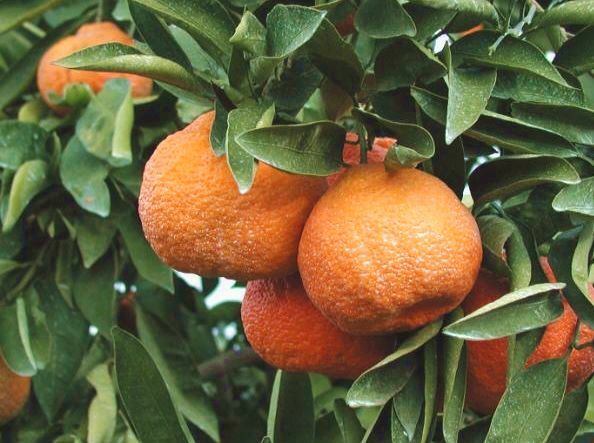 Rind medium-thick, fairly loosely adherent; surface relatively smooth but pebbled, with prominent, sunken oil glands; orange-coloured at maturity. Flesh colour orange; tender and melting, juicy; flavour mild, pleasant and aromatic. Climatically, the Ponkan is one of the most tropical mandarins. 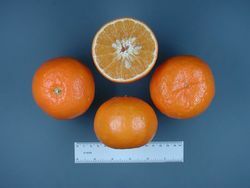 Under tropical conditions the fruit attains maximum size and quality and finds little competition from other mandarins. Ponkan is also known as Suntara mandarin. Changsha has recently become more popular in the cooler growing areas because of its good frost tolerance. It has survived - 15 C (4 F). 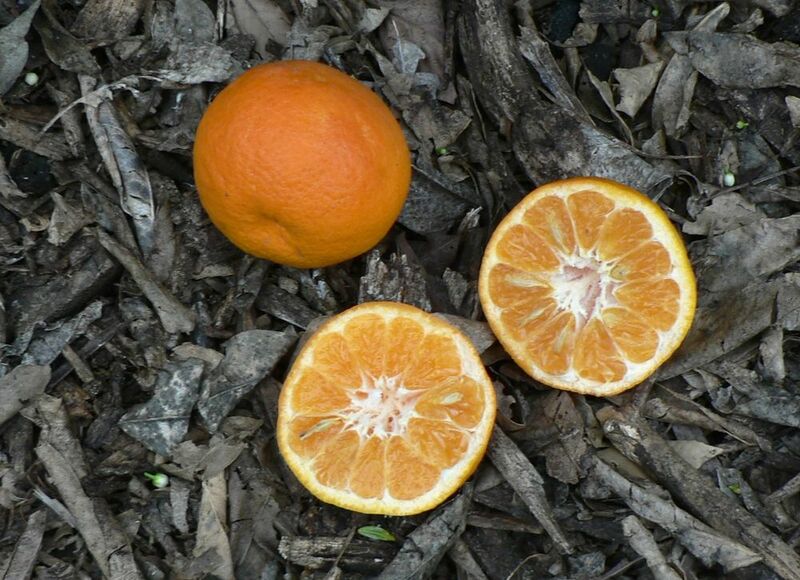 Changsha matures early in the fall and produces heavy crops of small, puffy, brilliant orange-red and seedy fruit. However, the fruit is very sweet and juicy. 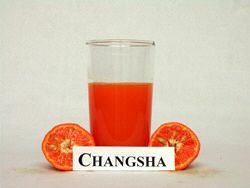 Changsha is used in the juice industry and it is grown as an ornamental. 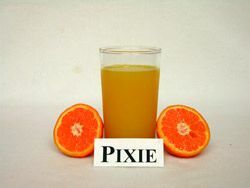 Pixie is a mandarin variety developed by H. B. Frost at the University of California Riverside Citrus Research Center. Pixie is the result of an open pollination of Kincy (King X Dancy) that took place in 1927 and was eventually released in 1965. The tree is a vigorous upright grower. The fruit is usually globose to slightly oblate, and sometimes has a neck. The rind is yellow-orange with a slightly pebbled texture and is easy to peel. The flesh is seedless, orange colored, and juicy. The flavor is mild and sweet. Pixie matures in late winter and holds exceptionally late on the tree; in certain mild locations, the fruit is known to hold well into summer. 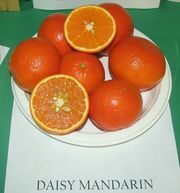 Daisy is a cross between Fortune and Fremont mandarins and is considered to outshine it's parents. Daisy was named officially by Dowlin Young of Young's Nursery in Thermal, California, after his wife. 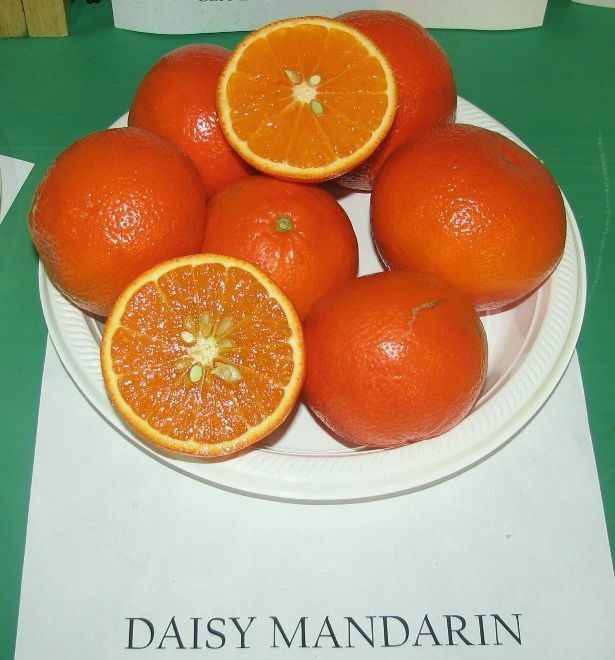 Daisy produces a medium-large, mid-season mandarin with an attractive dark orange rind. It peels and sections moderately well. The tree produces a heavy crop with the fruit held in large clusters. Daisy is moderately seedy with one to three seeds per section. Season is January to March. 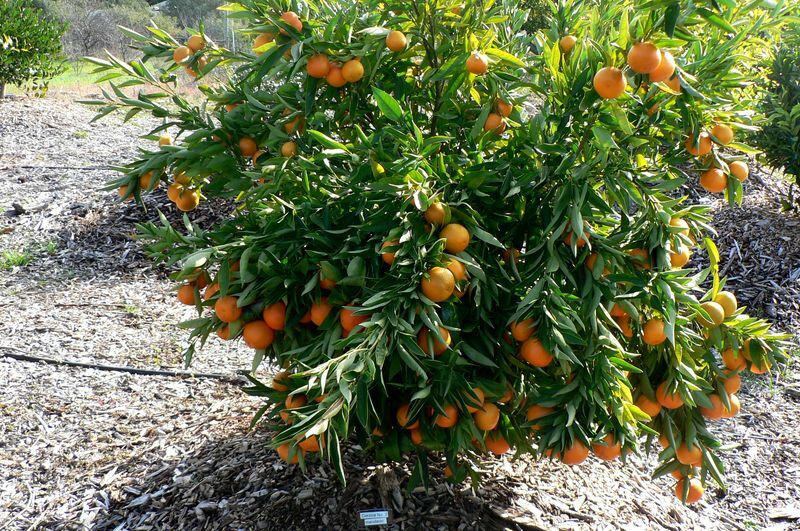 Gold Nugget is a recently-released mandarin variety developed within the University of California Riverside citrus breeding program. The tree grows vigorously and is upright in form. It can grow to a moderately-large size at maturity. 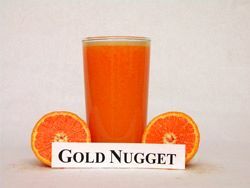 Gold Nugget fruits are usually medium in size and oblate in form with a somewhat bumpy orange rind. The aromatic rind is fairly easy to peel. The flesh is bright orange, finely-textured, and seedless. The flavor is rich and sweet. The fruit usually matures by early March, but holds exceptionally well on the tree, with summer-harvested fruit still of good quality. A mandarin with bright red rind. Probably originated in China and taken from there to Japan. 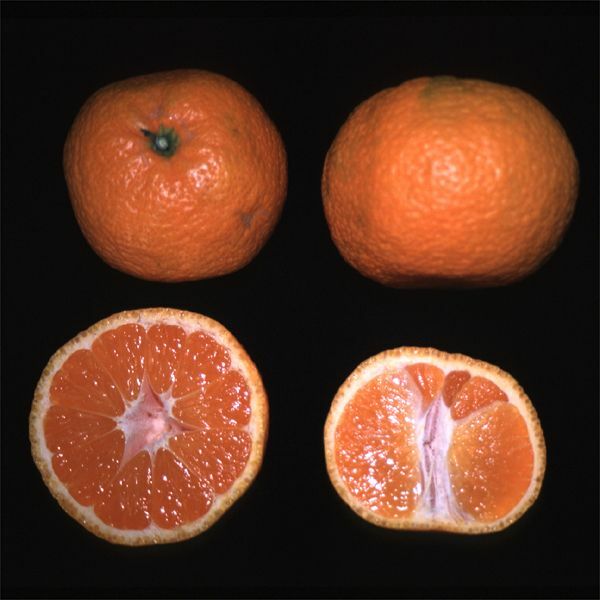 Tanaka gave it a species name Citrus erythrosa. A mandarin from the island of Martinique (French Antilles, West Indies) in the collection of SRA INRA-CIRAD on Corsica. Clementines were earlier thought to be hybrids of the Mediterranean mandarin and sour orange, but in 2002 scientists working in Corsica at the French National Institute of Agricultural Research (INRA) found by studying its chromosomes that the clementine is a hybrid of the Mediterranean mandarin and a sweet orange. 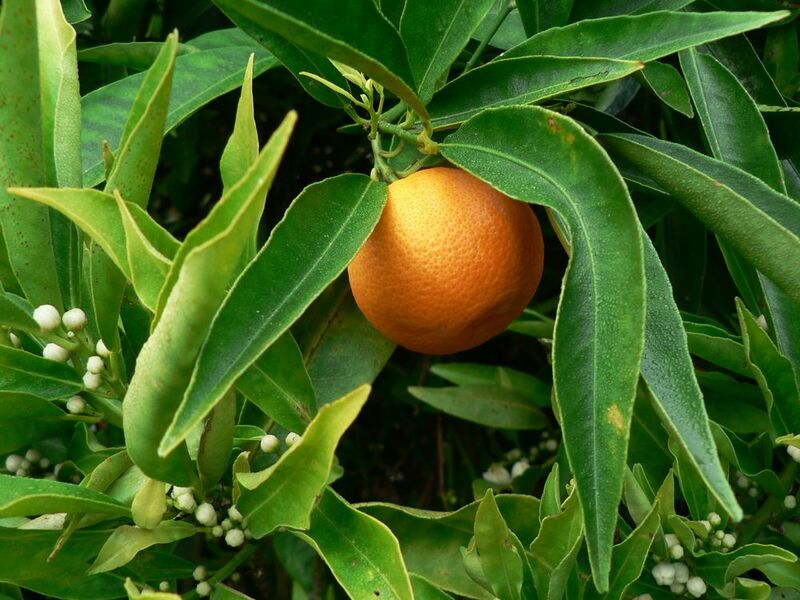 This highly important North African variety originated in 1902 as an accidental hybrid in a planting of mandarin seedlings (not grafted) of the Mediterranean mandarin, made by Father Clement Rodier in the garden of the orphanage of the Pères du Saint-Esprit at Misserghin, a small village near Oran, Algeria. 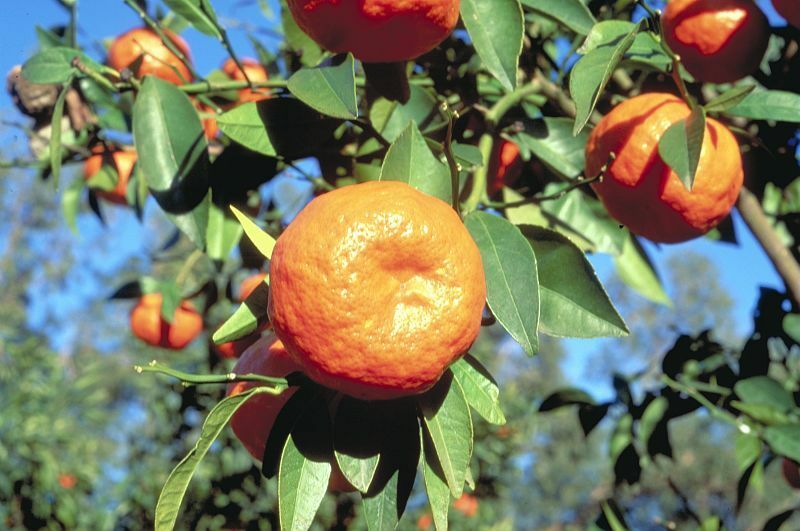 The full story and the origin of the clementine are in an INRA press release. Fruit size is variable, ranging from medium-small to medium. Form likewise quite variable, with a range from slightly oblate through globose to oblong and sometimes broadly pyriform from development of neck or collar. Rind medium in thickness, moderately firm and adherent but easily peelable and does not puff until well after maturity. Surface smooth and glossy but slightly pebbled because of prominent oil glands; colour deep orange to reddish-orange. Flesh deep orange; tender and melting; juicy; flavour sweet; subacid and aromatic. Seedless to very few seeds (depending on possible cross-pollination). Matures early. In addition to the varieties presented below, other well-known clementine cultivars include: Bruno, Esbal, Fina Sodea, Orogrande and Ragheb. 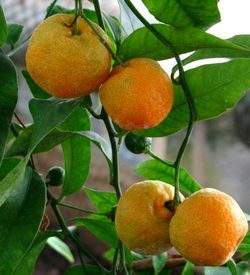 Clemenules (Nules, Clementina de Nules) originated as a budsport of Monreal in the town of Nules in the Castellon province, Spain. 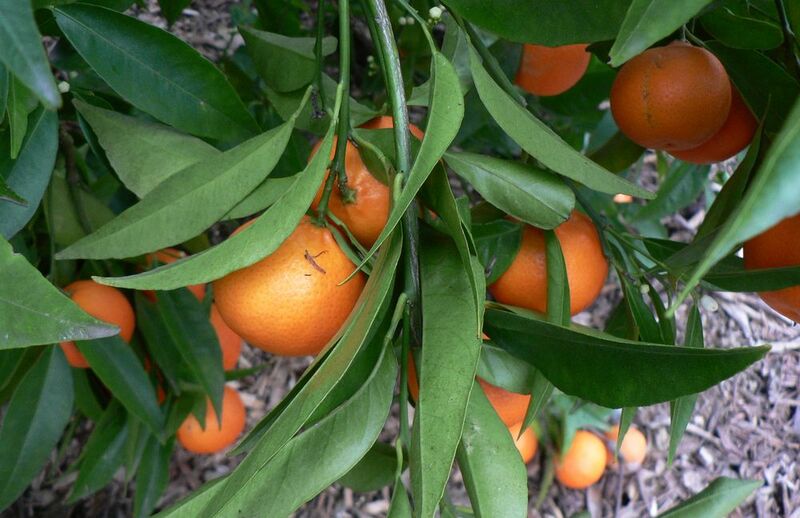 Clemenules is considered one of the best clementines for sweetness and flavour. The tree is vigorous but is ideal for limited space because it can be kept as a small bush and still bear abundant fruit. The seedless and juicy fruits mature in November. A spontaneous mutation of Fina, discovered in 1950. 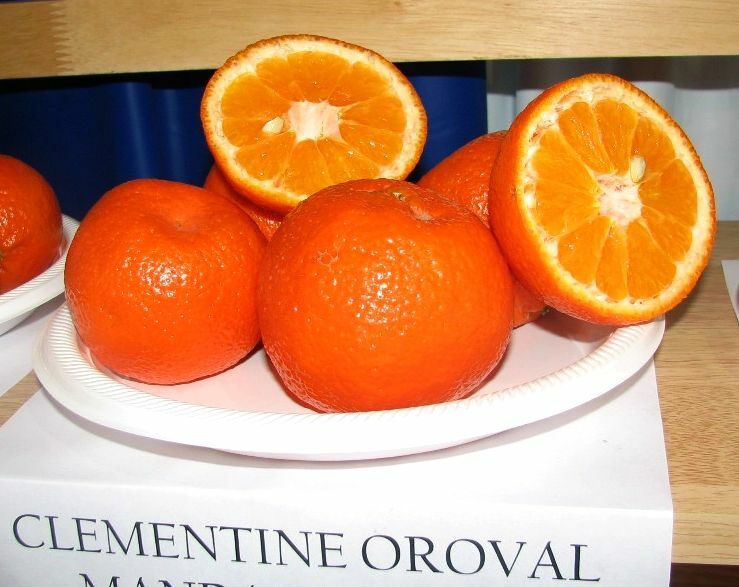 Oroval fruit are slightly larger but have less exterior colouration than other clementines. Algerian also known as Commune. 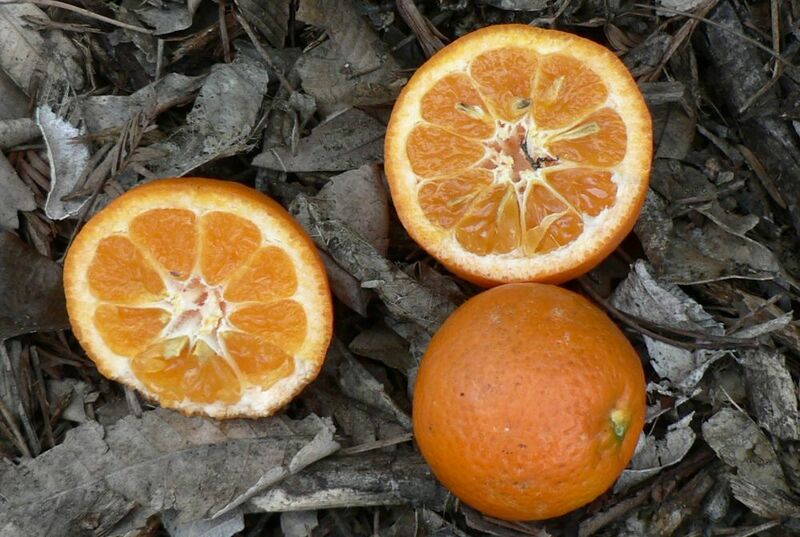 Commune and Monreal were the two original Clementine clones in Algeria. Tree is medium in vigor and size, spreading and round-topped; branchlets fine-stemmed, willowy, and nearly thornless; foliage dense. Leaves highly variable in size, narrowly lanceolate in form, and somewhat resembling the Mediterranean or Willowleaf mandarin. In most locations, regular and satisfactory bearing is assured only by the provision of cross-pollination. Tree strongly cold-resistant. Nour. This variety is an important Moroccan clementine. The fruit is of good colour but the rind texture is often coarse. The flesh is tender, juicy and of very good flavour. Harvest is mid to late January. The fruit will stay on the tree in good condition until March. Sidi Aissa. 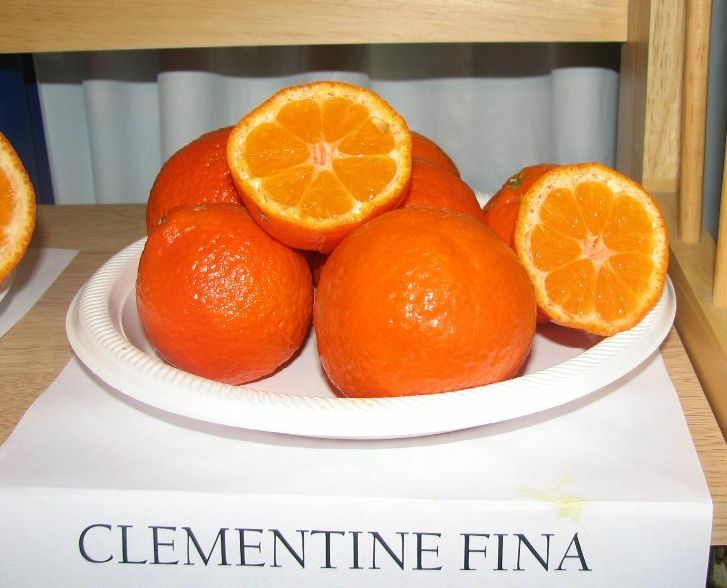 A mutation of Fina clementine discovered in Morocco. Valued there because of its large fruit size and durable peel. Sidi Aissa is very productive. It is said to have the same maturity period as Clemenules but better internal colour and flavour. Monreal was found in 1940 in the orchard of Vincent Monreal at Perregaux, Oran. 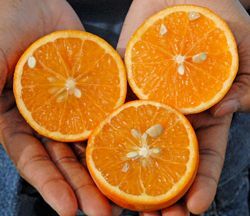 It is one of the most important mandarin varieties in the Mediterranean basin because of its early ripening in October. Monreal is self-compatible and without cross-pollination the fruit is regularly seedy. 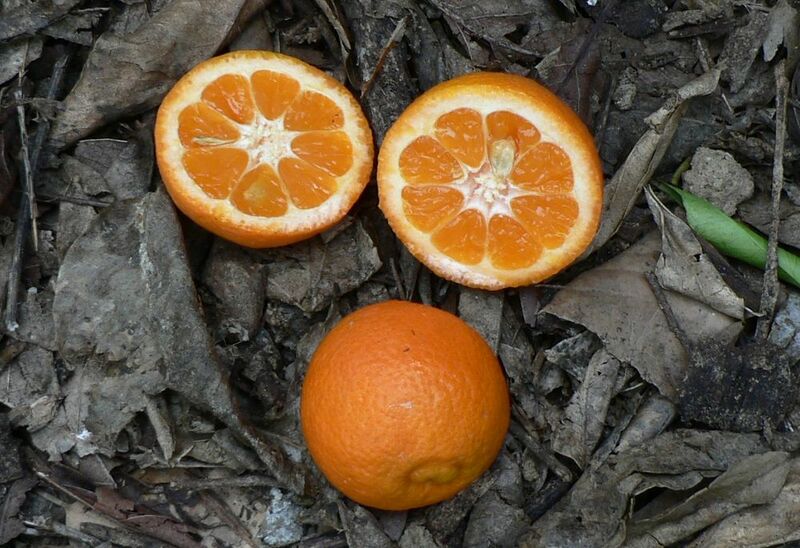 Monreal Clementine is one of the sweetest and easiest to peel in the mandarin family. 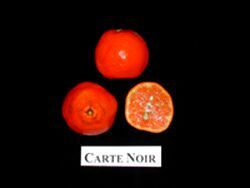 Carte noir is a Moroccan variety also known as 'Bekria'. It is a low-acidity early clementine variety. The pulp is fairly juicy, seedless, soft-textured and a pale orange colour. It is much appreciated locally by the North African community in France. Carte noir is one of the earliest citrus fruits to mature in the Mediterranean region. It is available from mid-September to mid-October. Corsica (top picture) Corsica is a medium-sized easy-peeling variety that grows in clusters and reaches maturity about 2 weeks later than Caffin. The island of Corsica is the only area of France where clementines are grown and several cultivars of the Corsican clementine exist and are grown all over the world as a result of the development programme carried out in Corsica since the late 1950's. 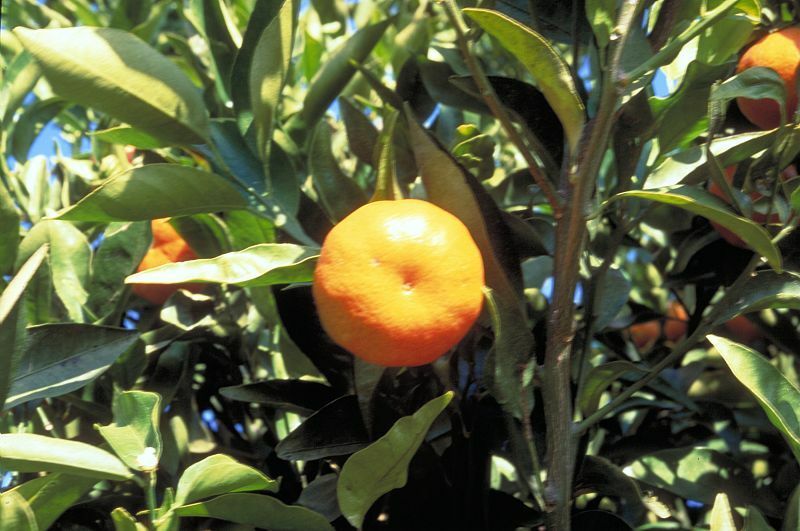 The original clementine cultivar was imported from Algeria into Spain in 1925. This variety is the one from which most Spanish clementines originated. The tree is vigorous with dense foliage and produces a good crop of fruit which is still regarded as one of the best flavours. Caffin (bottom picture) Caffin fruit mature slightly earlier than other clementines and colour up better but do not keep well on the tree. The taste and flavour are good and the fruit is juicier than many other varieties. Ortanique, often sold as a tangor. Both have many synonym names. Both are premium flavour mandarins for marmalade and jams. Fairchild, Lee, Osceola, Page and Robinson. Some confusion exists as to the proper use of the word tangerine. 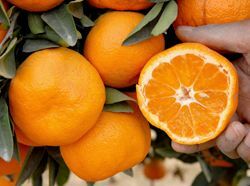 Tangerines were originally a group of Moroccan mandarin varieties (and their later hybrids) exported through the port of Tangier (Tanger in French), a town at the northern tip of Morocco, opposite Gibraltar. 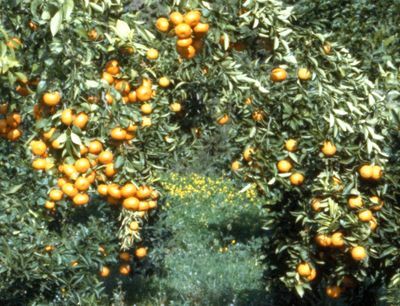 Some of the early mandarin varieties introduced to the United States came from Morocco. These varieties had skins of strong bright red colour. Horticulturists have tried to limit the use of the name tangerine to cultivars of similar deep colour. However, the name tangerine is commonly used in North America to denote all mandarin types. In this presentation only 'Dancy' and 'Beauty' are described as tangerines. 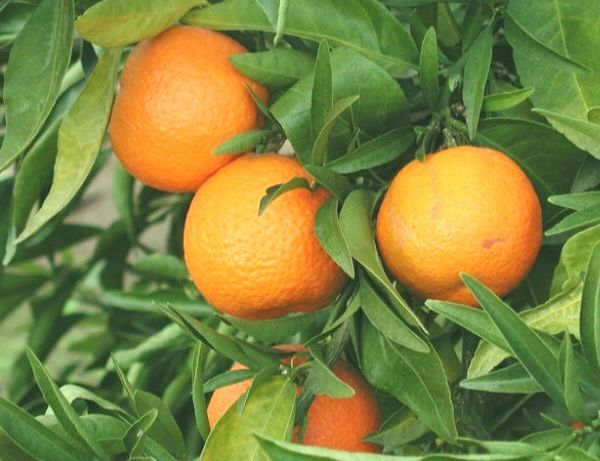 More recently the name tangerine has been used of the other parent of mandarin × orange and mandarin × grapefruit hybrids in order to secure the names tangor and tangelo. As Dancy was one of the first varieties used in these hybrids the names seemed justified. In the Mediterranean region the name mandor has recently been introduced to describe mandarin × orange hybrids. All said, within the group of mandarins the tangerines do not form a subgroup of natural significance. The use of the name tangerine is a matter of convenience. Da hong pao (Juhong) and Suen (Suen Kat). The original Dancy tree was a seedling in the grove of Colonel G. L. Dancy at Orange Mills, Florida, which was planted in 1867. The parent tree was said to have been introduced from Tangier (Morocco). Fruit are oblate to pear-shaped and of medium size. Peel is deep orange-red to red, smooth, glossy at first but lumpy and fluted later, thin, leathery and tough. Pulp dark-orange, of fine quality, richly flavoured. Matures in late autumn and winter. 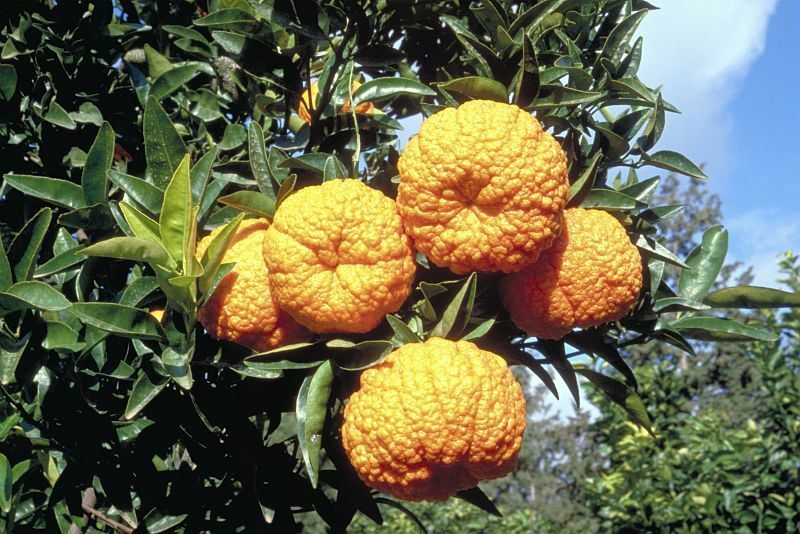 This is the leading mandarin in the United States, mainly grown in Florida. 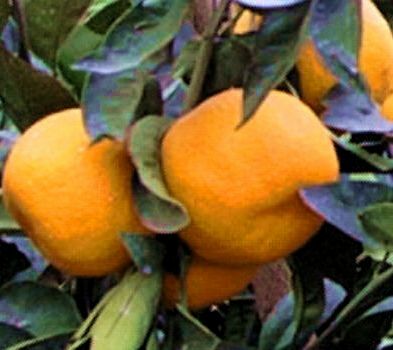 Dancy has been very important in the development of the tangerine x orange hybrids known as tangors and the tangerine x grapefruit hybrids known as tangelos. This cultivar is grown in many parts of the world and is also known as: Bijou, Christmas, Lady, Moragne, Obeni-mikan, Trimble, Welschart and Weshart. Beauty is said to have originated about 1888 as a seedling on the property of W. H. Parker, Glen Retreat, at Enoggera (a suburb of Brisbane), Queensland. The parent variety is unknown but the similarities with Dancy are such as to lead scientists to the conclusion that this variety is a seedling of the Dancy type. Beauty is highly popular in Queensland, where climatic conditions favour the production of large, superior quality fruit. Tree is vigorous, medium to large, upright-spreading, virtually thornless, with dense foliage of medium-sized, broadly lanceolate leaves. Fruit are medium in size, oblate. Rind is thin, firm, but easily removed; surface smooth and glossy; colour orange-red at maturity. Flesh is orange-coloured, tender, juicy and sprightly flavoured . Fruit are medium-small to medium, oblate to subglobose and seedless. Orange-coloured but commonly matures prior to development of good colour. Rind thin, somewhat leathery; surface moderately smooth and with large and prominent oil glands; easily separable. Segments 10 to 12, with tough carpellary membranes, loosely separable; axis hollow. Flesh orange-coloured; tender and melting; flavour rich but subacid. Season of maturity very early to medium early (includes the earliest-known mandarin varieties). Fruit holds poorly on trees after maturity and must be picked promptly, but stores well. Fruit large (for satsuma), moderately oblate, seedless with thin and smooth rind. Juice abundant, sugars and acid well-blended, and quality excellent. Matures very early and stores well for Wase Unshû. Is reported to reach legal maturity by the second week of September in optimal conditions. Tree more vigorous than most old Wase clones and productive. Miyagawa originated as a limb sport in a Zairai tree in Fukuoka Prefecture and was named and introduced by Dr. Tyôzaburô Tanaka in 1923. It is currently the best known and much the most extensively grown of the Wase varieties. Fruit somewhat more oblate than Miyagawa; averages higher in sugar content but matures a few weeks later. The tree is also more vigorous. 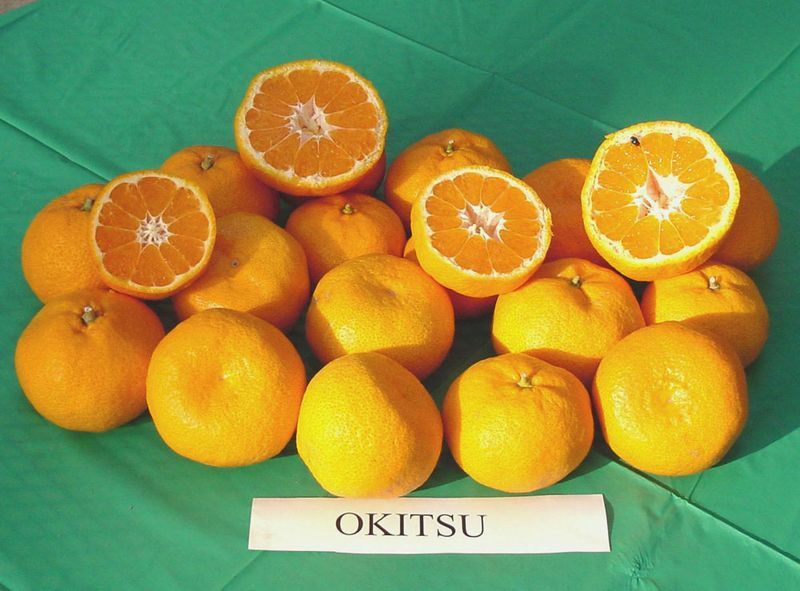 Okitsu originated as a nucellar seedling of Miyagawa from a controlled pollination with Poncirus trifoliata made by Doctors M. Kajiura and T. Iwasaki at the Horticultural Research Station, Okitsu, in 1940. It was distributed for trial in 1953, registered in 1963. It was introduced to Europe in 1983 and is slowly replacing Miyagawa as the most popular very early variety, especially outside Japan. It was soon followed by sister varieties Miho and Seto. 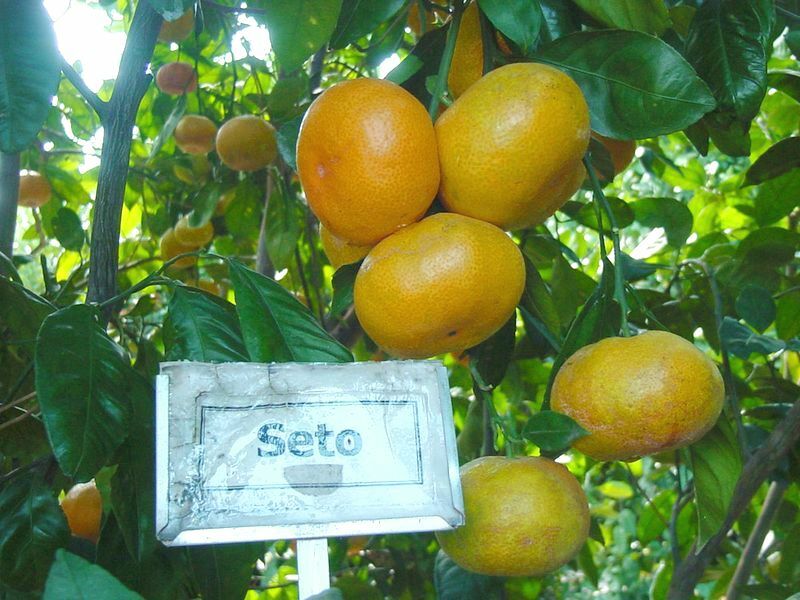 Seto and Miho are early-maturing, high-quality, cold-tolerant varieties obtained from Japan and developed from seed produced by controlled pollination of Miyagawa satsuma, similar to Okitsu above. The original trees were grown from seed planted in 1984 and they first fruited in 1990. Mature leaves are 12-16 cm long and 5-6 cm wide, with almost non-existent petiole wings, with Seto leaves being the larger. Trees are medium is size (3.0 - 3.7 m) with a low, spreading habit (4.0-4.6 m). Seto branches tend to droop compared to Miho.Seto leaves are oblong as opposed to elliptic for Miho. Seto peel is clearly smoother and thinner than other Satsumas. The fruit is noticeably flat and packs easily. Average full size is 10 x 3 cm usually containing 11 segments. Seto season is October through November. 'Kuno' is also known as Kuno Wase, Wasi and Temprana. 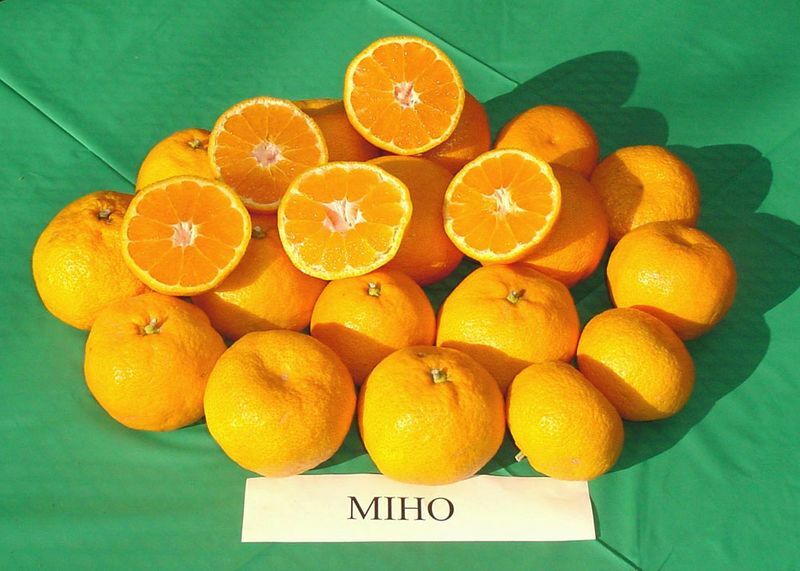 FRA Miyagawa, Okitsu, Seto, Miho et Kuno variétés de mandarine satsuma. 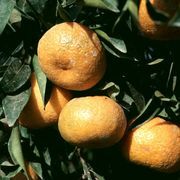 The late satsuma varieties ripen in November-December and hence are early to medium-early mandarins in their maturity season. 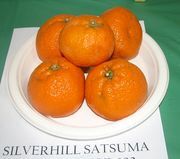 Owari is perhaps the most widely grown satsuma variety in the world today. This variety is of ancient and unknown Japanese origin presumably from the old province of Owari. 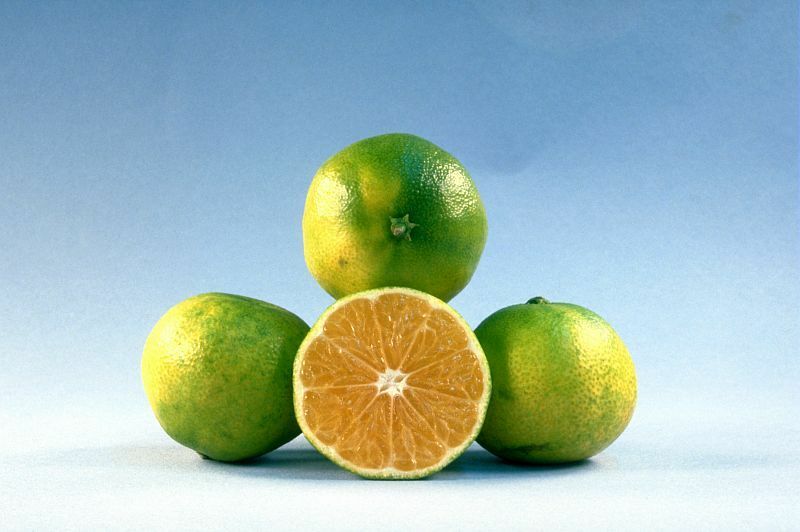 Fruit medium in size, medium-oblate to subglobose, seedless. Orange-coloured but commonly matures in advance of good colouration. Rind thin and leathery, surface smooth to slightly rough, easily separable. Segments 10 to 12, loosely separable, axis hollow. Flesh orange-coloured, tender and melting, flavour rich but subacid. Season of maturity early November-December. Fruit holds poorly on trees after maturity and must be picked promptly but stores well. Tree moderately vigorous but slow-growing, medium-small, spreading and drooping, very productive. Fruit medium in size, slightly more oblate than most, rind relatively thin and smooth, seedless. 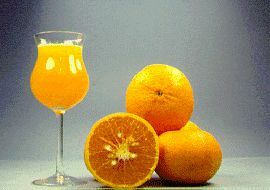 Juice abundant; sugars high and acid low (hence very sweet); quality excellent, stores well. Season of maturity early (November). 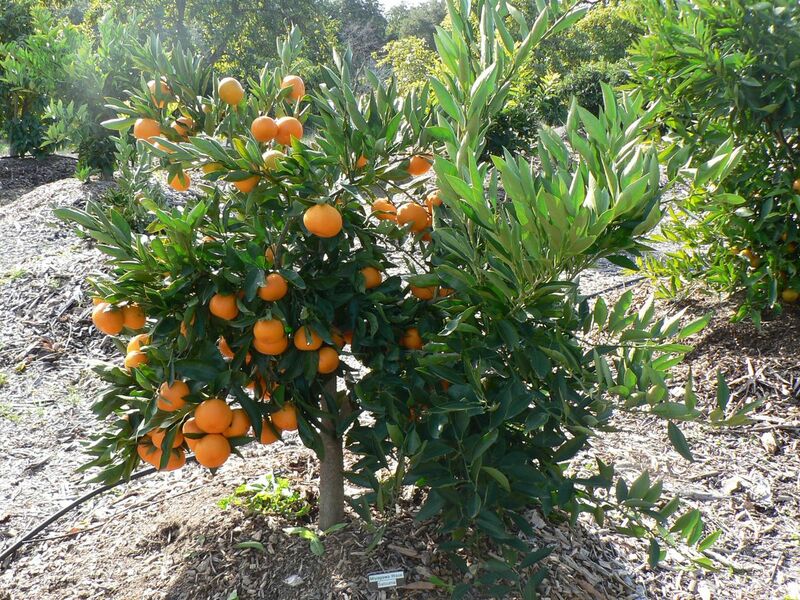 Tree very vigorous (for satsuma), more upright than most others, productive, markedly cold-resistant. Distinctive because of its deep orange-red colour. Fruit of good quality, ripening in late November or early December. Tree of medium vigour. This variety originated as a limb sport of Owari in the orchard of K. Dobashi in Shizuoka Prefecture and was noted about 1940. Kimbrough is a Louisiana Agriculture Experiment Station release. Its cold-hardiness is about the same as 'Owari'. Kimbrough trees are large, strong, spreading and very productive. The fruit is generally larger than Owari and stores well on the tree after maturity. 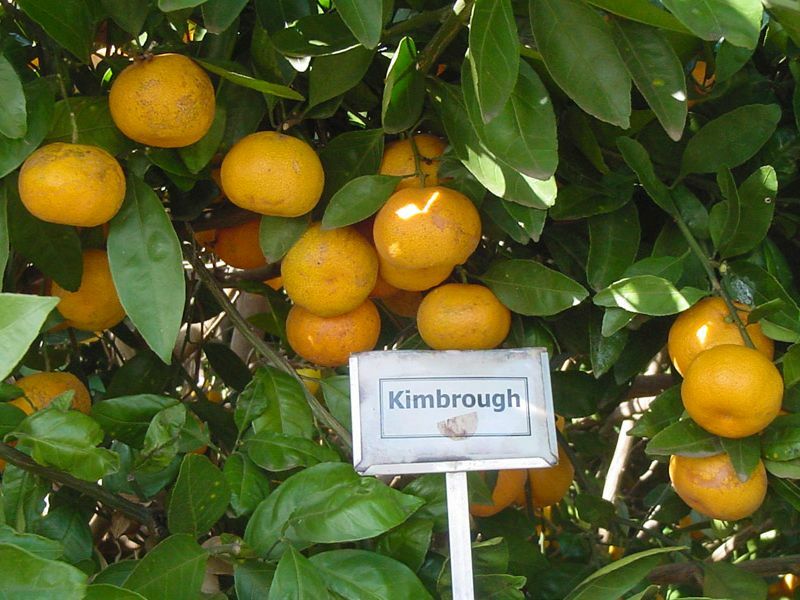 Kimbrough fruit is noted for its large size and the fact it has fewer seeds than other varieties of Satsuma. Excellent flavor. Kimbrough is reported to be hardy down to 12F ( -11 C) and it is known to have survided single digit temperatures for a few hours. Season is November-December. 'Aoshima' Aoshima is an Owari mutant discovered by H. Aoshima in 1950 in Fukudaga Valley, Shizuoka Prefecture. 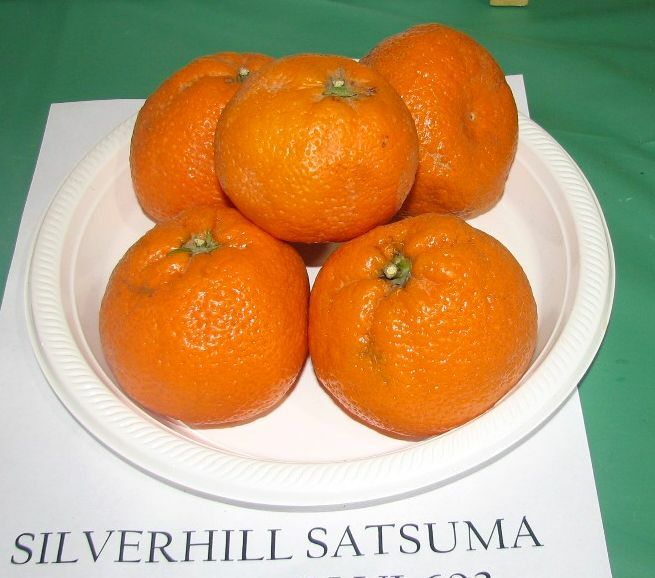 It is one of the leading late-maturing varieties of satsuma; harvested from mid-December to early January. Aoshima trees are vigorous, densely foliated and precocious as well as being reliable bearers. 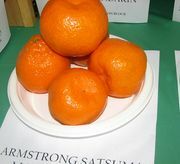 The fruit is larger than most other satsuma mandarin cultivars and has an attractive oblate shape with a smooth textured rind. An early satsuma selected by Albert Newcomb from the collection at Louisiana State University Citrus Research Station, Port Sulphur, LA. Similar to Owari, this variety has the same vigour, but matures in late September to mid-October. The fruit is slightly larger and not as cold hardy as either Owari or Kimbrough. Because of the great popularity of satsumas new varieties are being developed continuously. 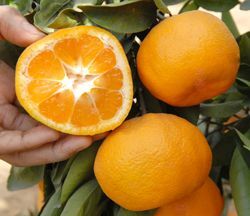 Dart North and Dart South are new late ripening Owari varieties from the UCR Citrus Development Station in Riverside. They were received as budwood from Lange Ranch, Dart South Avenue, Woodlake, California, as two of several owari satsuma budlines collected from Central Valley by Kim Bowman and Raul Gonzales. In Riverside both reach legal maturity at the end of October. According to UC-Riverside CVC fruit quality data Dart North has a higher juice content with a higher total sugar amount than Dart South. According to UC-Riverside CVC fruit quality data Dart South had a lower acid content but a higher acid sugar ratio than Dart North. Xie Shan is the Chinese translation of the original Japanese name ‘Wakiyama’. 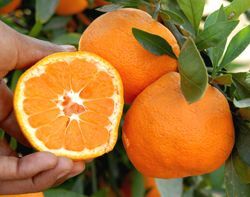 It has a unique flavour and taste that differs from other Satsumas. 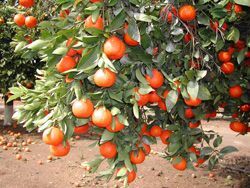 With harvesting starting by mid-September Xie Shan together with 'Miyagawa' forms a new group of easy-peeling, completely seedless, super-early satsumas. Mediterranean mandarin (Willowleaf in the US) is the common mandarin of the Mediterranean basin, which is known by many names including Ba Ahmed (Morocco), Blida, Boufarik and Bougie (Algeria), Bodrum (Turkey), Paterno and Palermo (Italy), Nice and Provence (France), Valencia (Spain), and Setúbal (Portugal). Synonyms for common or native are commune (French), comuna (Spanish), gallego (Portuguese), koina (Greek), yerli (Turkish), and beladi (various spellings) for Arabic. Other names include Effendi or Yousef Effendi (Egypt and the Near East), Avana or Speciale (Italy), Thorny (Australia), Mexirica or Do Rio (Brazil), and Chino or Amarillo (Mexico). In the United States, it is known as the Mediterranean or Willowleaf mandarin. 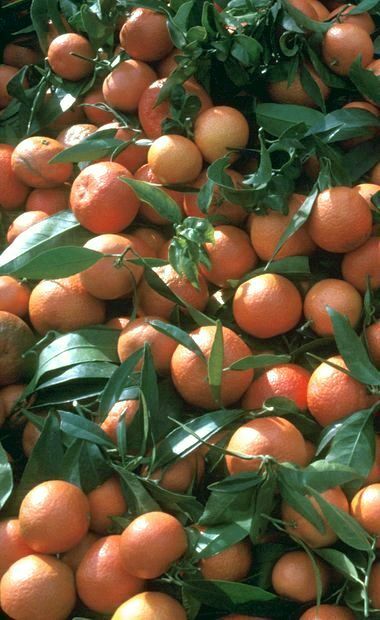 In comparison with the other mandarins, the most distinctive characteristics of the Mediterranean mandarin include: (1) the small size and narrow-lanceolate form of the leaves and the special nature and aroma of the oil they contain; (2) the mild and pleasantly aromatic flavour of the juice; (3) the distinctive nature and fragrance of the rind oil; and (4) the plump and almost spherical seeds. Another distinctive characteristic not confined to this mandarin is the spreading-drooping habit of growth. The rind oil is used in the preparation of perfumes and toilet waters and for the flavouring of confections and carbonated beverages. Petitgrain oil, which is distilled from the prunings and comes mainly from the leaves, has a strong and characteristic odour. See Citrus oils. Since this highly distinctive mandarin appears not to have been found in the Orient, it seems likely that it originated in the Mediterranean basin and almost certainly in Italy, where it appeared between 1810 and 1818. Cultivars: Avana, Chios, Emperor, Montegrina, Natal and Willowleaf. In the earlier French literature, it was commonly referred to as the Indo-Chinese or Cambodge mandarin. The Japanese name kunenbo (Kunembo) applies to forms that occur there and in China, Taiwan (Formosa), and Okinawa, which are somewhat different but are considered to belong to this species. It seems to be the consensus that the King group originated in Indo-China, whence it spread northward as far as Japan and southward throughout Malaya. Many of the mandarins currently found in the Malayan region and a few in China appear to be of the nobilis type. 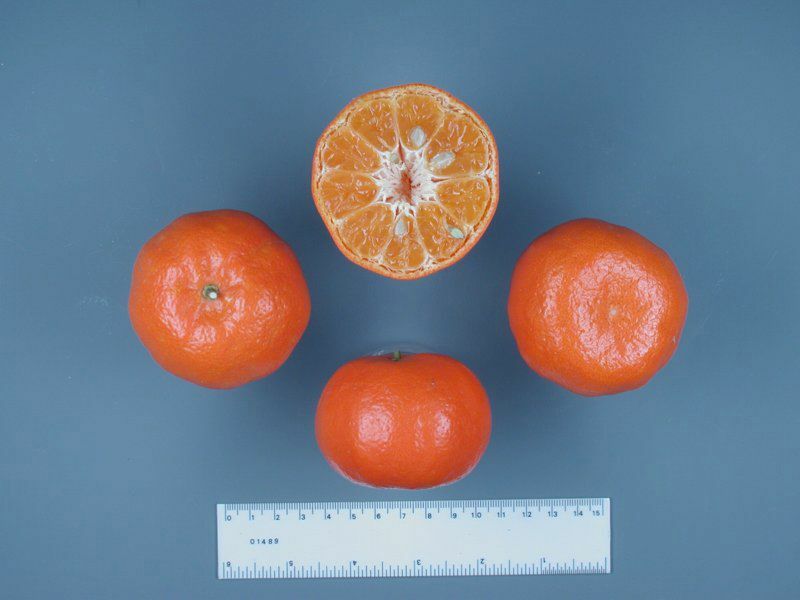 Some of the characters exhibited by this group are orange-like and others are intermediate between that fruit and mandarin, which supports the conclusion that the King type probably originated as a hybrid between the two and is therefore a natural tangor. Fruit are large (among the largest of the mandarins) and oblate to depressed globose. Rind thick (very thick for mandarins), moderately adherent but peelable; surface moderately smooth to rough and warty. 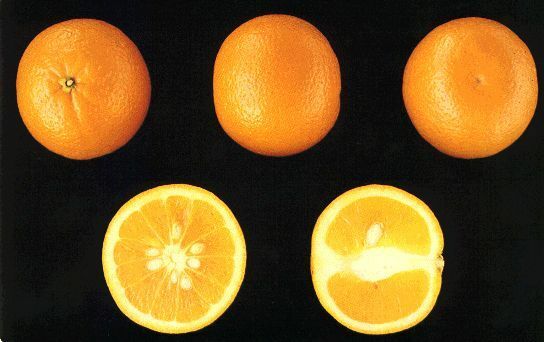 Deep yellowish-orange to orange at maturity. The horticultural King variety originated as a seedling from fruits of that name received by H. S. Magee of Riverside, California, in 1880 through the courtesy of the United States Minister to Japan, John A. Bingham, who arranged to have them sent from Saigon, Cochin-China (South Vietnam). It is stated that Magee, who was a nurseryman, sent both seedlings and budwood to J. C. Stovin of Winter Park, Florida, in 1882. Similar cultivars have long been known all over South-East Asia. Climatically, the most distinctive feature of this variety is its very high heat requirement for the attainment of horticultural maturity and good quality, for which reason it is the latest ripening of the mandarins. The fruit also is markedly affected by environmental influences, including both rootstock and soil. In the fertile soils of Florida on sour orange root stock it produces large fruit with smooth skin and excellent flavour. On rough lemon in lighter soils it produces rough-skinned fruit with a less pronounced flavour. In California the fruit barely have time to mature except in the hottest interior districts and they have rough and warty skins and sometimes look unattractive. A King-type (Citrus nobilis) variety grown in Japan. 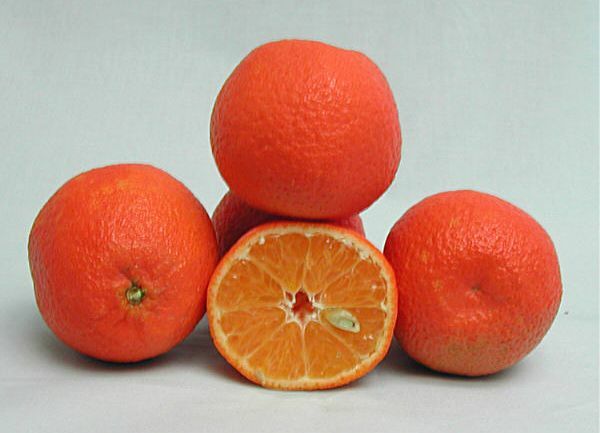 The Japanes name Kunenbo refers to this group of mandarins, also found in China, Taipei and Okinawa, as opposed to the satsuma group (Unshȗ mikan) and other mandarins types found in Japan. Characteristics as in King mandarin above. 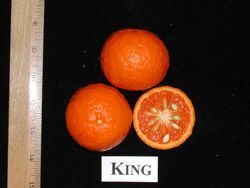 Other King mandarin varieties: 'Guanxi Shagan' 'Huang Yen Man Chieh', 'Huangyan Bendi-guangju', 'Shagan' (China), Som-Chuck' (Thailand).